Paczki Day (aka Fat Tuesday) may sound like an excuse to grab a dozen doughnuts, but it is so much more. The paczki is a Polish doughnut. In other words, it is fried dough filled with fruit preservatives or sweet cream and topped with powdered sugar or glaze. Lest you be wondering, About.com's Guide to Eastern European Food has a video demonstrating how to make a paczki. Historically, Fat Tuesday was an opportunity for Polish Catholics to eat all the sugar, eggs and lard in their house before Lent. Whether Catholic or not, however, Detroiters knew a good holiday when they tasted it and headed to Hamtramck -- the city that has in the past made Fat Tuesday a week-long holiday. When is Paczki Day in 2015? 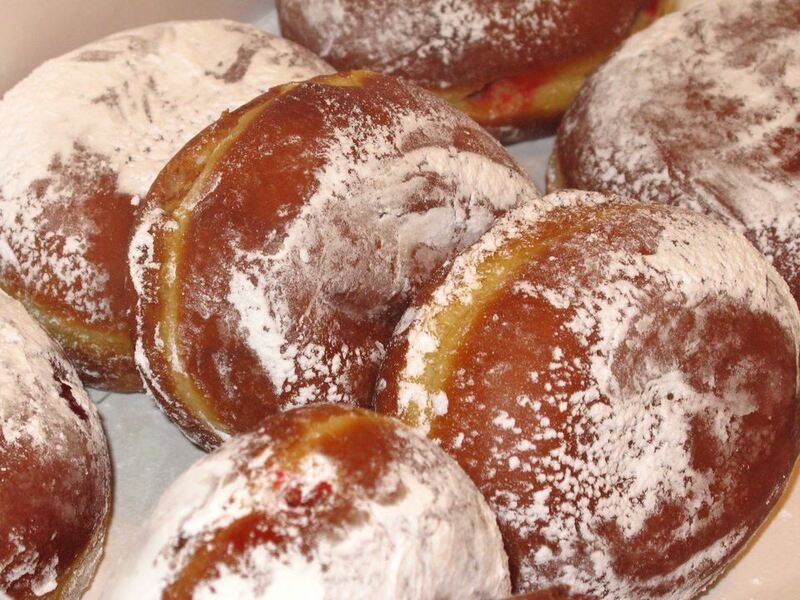 Paczki Day is on Tuesday, February 17th in 2014. There is a good reason Detroiters head to Hamtramck: the city's many Polish bakeries don't stop at one or two varieties of the paczki. No, they go to great lengths to make that fried dough something special. For instance, New Palace Bakery will be gearing up for the special day with several different kinds of paczki. In addition to a host of traditional flavors, the bakery has created several specialty paczki: Rosehip, Strawberry Chocolate Delight, Pink Ribbon, Hamtramck 75th Anniversary (strawberry/custard combination), Raspberry Glazed, Millennium Swirl (chocolate/custard combination), Presidential's Choice (cherry filled with chocolate on top), Cookie Crunch, Caramel Cream, and Strawberry / Chocolate Delight. The bakery also makes several types of paczki with two or three fillings in one. The bakery introduces a new specialty every year or so. New for 2015, the bakery offers Chocolate / Marshmallow Crunch and Chocolate Hazelnut / Buttercream. Paczki Run 2015 is a 5K run through Hamtramck on the Saturday before Paczki Day on February 14th. The event is apparently aimed at helping people make room for those paczki. Small's Bar opens at 10 AM on Paczki Day and offers live music, including the Polka Floyd show, Captains of the Head and Eastside Elvis & The Motor City Mafia. Expect Polish food and, of course, the bar's now famous Paczki Bomb. While Hamtramck is point zero for paczki, several other bakeries in the Metro Detroit area provide a pretty good Polish doughnut, including West Warren Bakery in Detroit. For better or worse, paczki have become so popular that local supermarkets such as Kroger and Busch's carry them, which makes it way too easy to get a hold of a box. The question is whether the Hamtramck paczki makes it worth the trip.